The summer sun isn’t far away and soon enough we’ll be dreaming of sandy beaches, crashing waves and cocktails on the beach. But for those of us that aren’t going away this year, here are some quick and easy touches to brighten up your home with some seaside décor. Blue is always a colour we’ll associate with the seaside and summer. 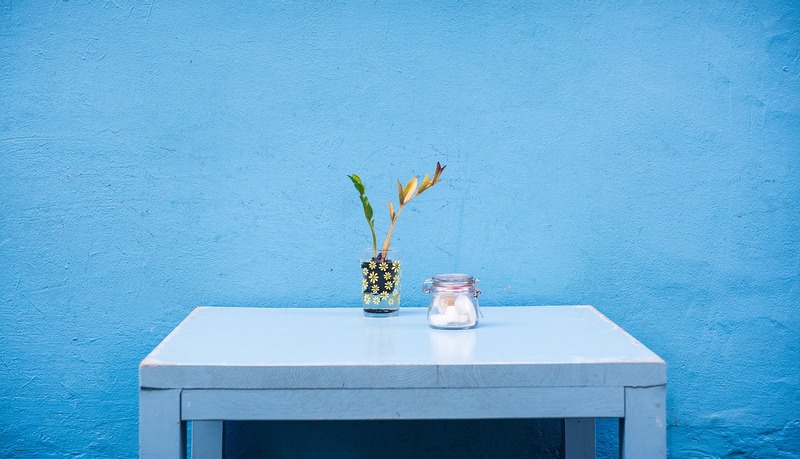 Whether it’s the deep blue sea, the bright blue sky or even the beachfront huts we know and love dotted around seaside resorts of the UK, blue is definitely a colour you’ll have to incorporate in some way into your décor. To read our guide on decorating with blue, then be sure to read this post. For a few accents, be sure to choose some lovely blue cushions for the living room (shell emblems, optional!) or a deep blue lampshade for the sideboard to subtly highlight and brighten up the room. If you’re willing to take a bigger risk, then be sure to invest in a Queen Anne or winged armchair in a gentle pastel colouring or daring aquamarine. Why not invest in a stunning light blue sofa such as this one if you want to make your coastal look a little more permanent? Panelling is perfect for the coastal cottage feeling as it’s got a relaxed, summery, weathered type of feel and it’s really easy to attach. Budget friendly – you can use reclaimed wood such as those from pallets, for example. Search for a wood with lots of character – it’ll really add to the rustic charm and if you pay a visit to your local builders yard you may even be able to get some for free. And you can’t really argue with that! Stain your planks first, wipe them off slightly and leave them to try. Once this is done, simply paint over with your white wash and attach to your walls! Job done. Finally, it’s time to accessorise your brand new room. 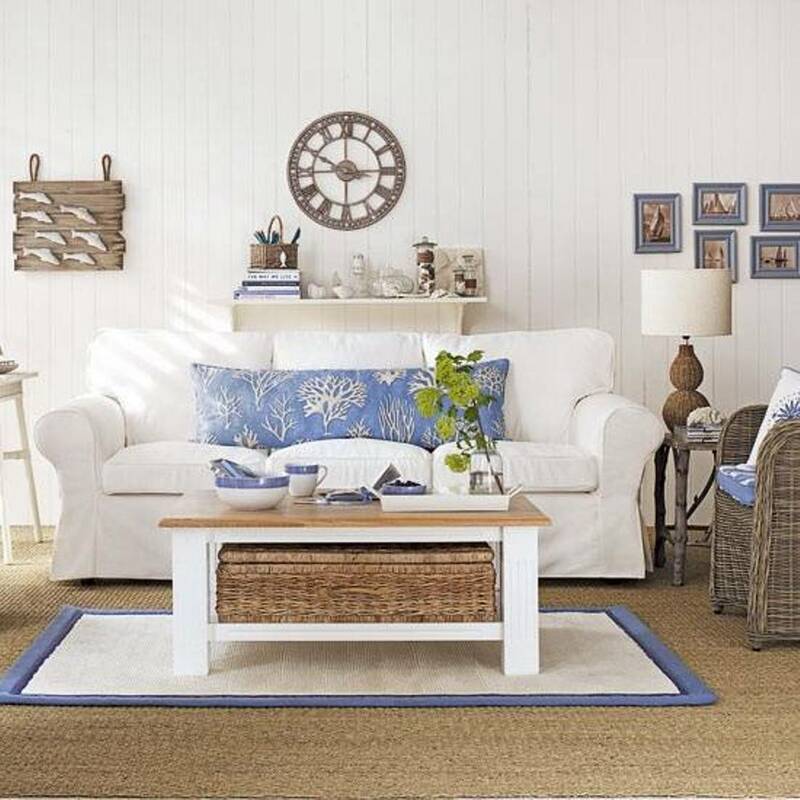 Choose white or wicker furniture such as coffee tables and sideboards to add to your seaside look. Add some seascape artwork on the walls along with some decorative shells, pretty anchors and even a vase filled with pretty shells to place on your mantel or tables and the look is complete! The coastal look is perfect for bathrooms or living rooms but can even work well throughout the home in dining rooms and bedrooms too. What do you think of the seaside look? Where would you have a coastal cottage feel? Be sure to get in touch via Facebook or Twitter and let us know!